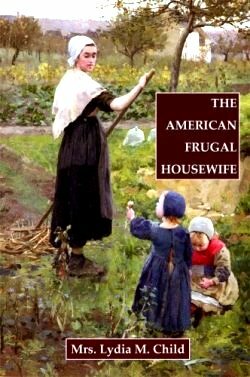 The American Frugal Housewife Practical ideas that still work. One of the ways we can reduce the damage to our pocketbooks and waistlines is to cut back on the amount of food we buy and cook, and to use all of those ingredients to advantage. Careful use of our resources is self-reliant, reduces the drain on the world's resources to feed the hungry, is healthier, and is simply good practice in our "household business". We think that buying only what you can reasonably use, cooking it well, preparing and serving just enough and using leftovers and planned overs creatively are exactly the way to manage your kitchen. Learning to preserve abundance by canning, dehydrating, pickling or freezing limits waste too. Simpler menus and recipes certainly help, costing less time and money. We have plenty of ideas for using up leftovers, planned overs, excess in our pantries and the abundance of food we purchase because it is so available in our society today as well as what we grow or have been gifted with. We're sharing them here, hoping you will find some ideas that will benefit you and your family. Suggestions with links to recipes are included.